At the start of the month we had time to enjoy a relaxing weekend, visiting some of our family members who we have not had the opportunity to see for some time. The weather not being too good our strolls along the promenade at Morecambe meant that they were a little curtailed over this weekend. Monday 3 December, back to work today and off to Leyland and the Provincial office for the last Cabinet meeting of 2018. Only one apology received, so we were able to undertake all the necessary work of the Craft Cabinet that morning. Quite a busy but a very stimulating and satisfying meeting. With the principals and guests and the Chapter of Fortitude. The next day was a short trip to Lancaster Rowley Court Masonic Hall for the installation convocation of the Chapter of Fortitude No 281. I was accompanied by Paul Renton, Chris Butterfield, a number of officers of Supreme Grand Chapter plus David Thomas, Mark Barton and David Case together with a goodly number of my acting Provincial officers of the year. It was great to meet up with many companions from the Lancaster group that I had not seen for quite some time and I certainly received a very warm welcome. The chapter room was full as we witnessed the installation of Stewart Aimson, Paul Dent and David Grant. The installing principal, Nigel Parrish, did an excellent job. I was extremely pleased to receive a donation from the chapter to the MCF 2021 Festival. Following the meeting we enjoyed dinner and speeches and then on this occasion the very short journey home after another excellent evening. The following morning, I was off to Litherland Masonic Hall for the meeting of Athenaeum Lodge No 9368 of which I am currently the `Chief Steward`. It was a very short business meeting which was followed by the annual ‘Christmas Luncheon’. A very enjoyable occasion. On the Thursday I took care of some paper work that morning before setting forth for Saul Street, Preston. That afternoon was the enthronement meeting of my Red Cross of Constantine conclave. The meeting was well attended by the members and we had a most enjoyable meeting. Maureen and I then enjoyed a very relaxing weekend, preparing many things for the coming festive break. Barry Jameson and I, getting into the festive spirit! On the Tuesday, after breakfast I walked down to Great Queen Street where I had an appointment with the Grand Secretary David Staples together with the Grand Principals and other Royal Arch Grand Superintendents. Following that meeting I attended the Royal Ark Mariner Assembly which was held in the Grand Temple. 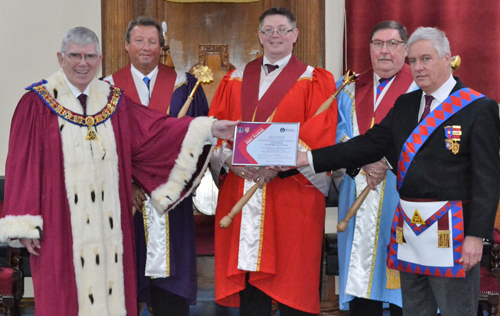 That afternoon I was the acting Junior Grand Warden and assisted the Pro Grand Master to open the Grand Assembly. It was the annual investiture and West Lancashire was very well represented. Following the meeting we all adjourned to the Connaught Rooms for the festival dinner. After breakfast the next day, those brethren who had stayed overnight joined us for the Quarterly Communication of Grand Lodge which was held at 12 noon. The Grand Temple was full to capacity and I am most grateful to all those brethren from West Lancashire who came to support me on this occasion. The meeting was opened very quickly, the general business conducted by the Pro Grand Master Peter Lowndes, following which the Grand Secretary, David Staples gave a wonderful presentation of `Caretakers, Risk-Takers and Undertakers` the three faces of UGLE. His thoughts, vision and actions for the future of UGLE. This was well received by all attending. Following the meeting we had to make our way back to Euston for our train back to the North West. Another great sojourn to Grand Lodge. 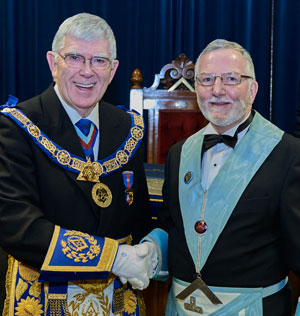 Congratulating John Galbraith of Lilford Lodge. Waking up to a beautiful winter`s morning on the Thursday, Maureen and I took the opportunity to take a short walk along the promenade and enjoy the magnificent views across the bay. In the afternoon I travelled to Leigh for the installation meeting of Lilford Lodge No 3022. I received a very warm welcome on my arrival and very quickly donned my regalia for photographs prior to the meeting. I was accompanied on this occasion by David Ogden together with many other grand officers from West Lancashire and Cheshire. That evening my DC was Malcolm Bell who was assisted by Gary Smith. It was good to see so many brethren and their guests occupying their seats ready to witness the excellent ceremony conducted by Tony Roe, the installing master. He installed John Galbraith in a most dignified and sincere way. The whole ceremony was excellent. I was delighted to receive a donation to the MCF Festival from the newly installed master. After pre-dinner drinks we sat for an excellent dinner which was followed by the usual after dinner speeches, before having to leave for my return journey after a very memorable evening. On 19 December I travelled firstly to Saul Street in Preston where I was met by David Winder, Stephen Kayne, Mark Matthews and John Smith and was delighted to receive a wonderful donation towards the 2021 Festival for the MCF. I then travelled on to Leyland to meet with the Provincial office team for a ‘get together’ prior to Christmas. On returning home, Maureen and I attended Poulton le Sands Lodge where the ladies were invited for our special Christmas celebration. 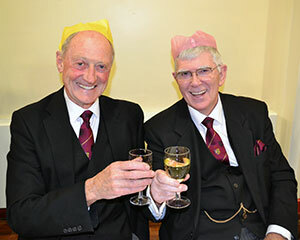 We enjoyed a dinner and entertainment, which was very well attended by the members of the lodge, their ladies and many guests. A great evening to bring the lodge to a close for 2018. The next morning, I sadly travelled to Liverpool with Peter Taylor, Phil Gunning and many more brethren for the funeral of Cyril McGibbon. Cyril was the eldest Freemason in UGLE and he had sadly passed to the Grand Lodge above. Our brethren certainly represented Freemasonry in its highest splendour. Receiving a very welcome and generous donation from the WLFC towards the Festival. On the Friday I travelled to Manchester with Maureen. I was attending a Mark Masons meeting at Bridge Street and Maureen was set free to roam the city with `her card` for some last-minute Christmas shopping. I believe we both had a great day. The day prior to Christmas Eve, I drove to Liverpool John Lennon Airport, to meet our daughter Tracey and her husband Peter who were arriving from the Isle of Man to stay with us for Christmas. The weather was atrocious, but it was wonderful to see them both and we had the pleasure of their company over the festive break. It gave us the opportunity to have all our family and friends round to see Tracey and Peter over their short but fantastic stay with us. Apart from enjoying far too much food etc. we enjoyed our walks along the promenade to witness the fabulous views across the bay and to walk off some of the calories from the delectable mouth-watering dishes that Maureen had prepared for us all. We, like you all I hope, had a terrific time with all our family. Saturday 29 December arrived all to early and sadly it was time to say goodbye to Tracey and Peter as we took them back to John Lennon Airport for the homeward flight. Now we both got back to having a few quiet days before the enjoyment of preparing for the New Year. The last day of 2018 and after a quiet morning Maureen and I took a short walk along the promenade to Heysham. What a beautiful day it was with wonderful views of our Lakeland hills. Later we attended a New Year`s party in the company of several friends, a great dinner and dance and enjoyed the start of 2019. We had a great evening and now look forward to the year ahead. I trust that you all enjoyed your celebrations and as we start the New Year, Maureen and I wish you all a very happy, healthy, peaceful and prosperous 2019 and we look forward to being with you on many future occasions.